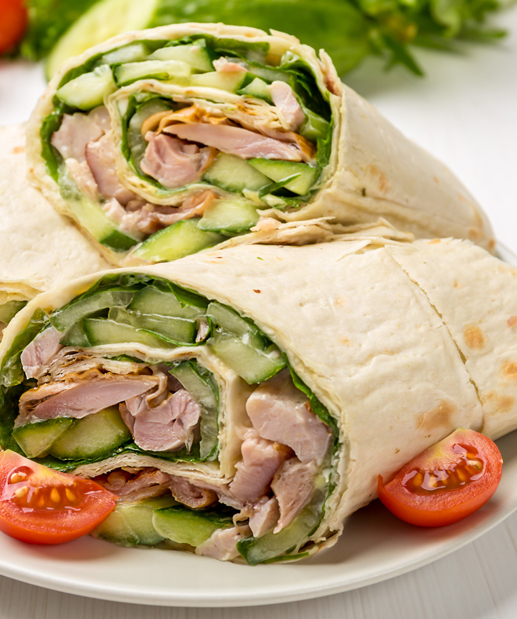 Wraps are a great way to make a sandwich that won’t fall apart, and some kids actually prefer wraps to traditional between-the-bread sandwiches. All kinds of variations are possible with this one – try it with olives, grilled zucchini, eggplant, or summer squash. 1. On each of the tortillas place basil pesto, chicken, roasted mushrooms and peppers, onion, lettuce, salt, pepper, and cheese. Fold in ends and roll.